One of the top EMS service providers in Texas, Cy-Creek EMS (CCEMS), is facing tough financial challenges as it faces massive increases in population in the coming years. The district is expected to grow from 500,000 to 750,000 in the next 7 years. That represents over 35,000 new people per year needing additional services and expecting the award winning level of support Cy-Creek have come to expect over the past nearly 40 years. On Saturday, May 11, an election is being conducted by Harris County Emergency Services District 11 to ask voters to approve a proposed tax rate cap increase. A vote in this election just might save your life or the life of a loved one or neighbor. In fact, the level of service is so exceptional at CCEMS, in 2011 they were awarded the top public/private EMS provider award. 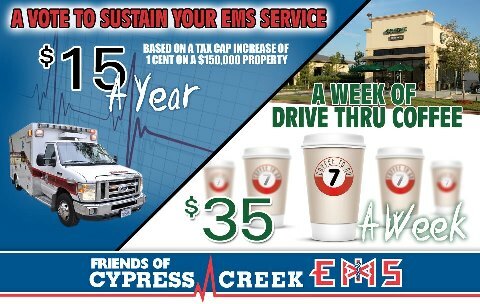 According to The Cypress Creek Mirror (a Houston Chronicle neighborhood news service), Cypress Creek EMS was awarded 2011 Texas EMS System of the Year by the Texas Department of State Health Services, and Dr. Levon Vartanian earned recognition as 2011 Texas EMS Medical Director of the Year. In 1984, CCEMS first earned recognition as the Texas EMS System of the Year, and in 1985, was awarded the coveted National Emergency Services of the Year. In addition to this award, CCEMS was also presented a "10 Best" Award from Principal Insurance. This reflects the commitment to excellence in service provided by the employees and management of CCEMS. More information about the service commitment and innovation of CCEMS can be found on the Friends of CCEMS website or on their Facebook page. In order to deal with the rapid expansion of population and the corresponding demand for services, Harris County ESD 11 is proposing an increase in the tax rate cap from $.03 per $100 valuation to $.06 per $100 valuation. This will not mean a three cent increase on next years tax bill, it simply raises the cap. Leaders of the ESD board told the Houston Chroniclethey do not expect an immediate tax increase. Tax rates for ESD 11 have not been raised from the three cent rate that was initially established when the board was created in 2004. "As a leader of one of this communities law enforcement service providers, I am frequently called upon to utilize the services of Cypress Creek EMS. Like this community, I am fortunate that we have a world class emergency medical service provider in our community and one that constantly strives to provide better and more advanced services. From tactical EMS working alongside us on felony arrest warrants to bike medics at large events, we often see Cypress Creek step up to ensure the physical safety and health of not only officers but participants and by-standers. I believe the proposed tax rate cap increase is critical to the long term growth and success of emergency services for our area and I support their election proposal." Two newly elected members of the ESD have been pushing an agenda to privatize the emergency medical services in the district. Could this be because one of them has ties to commercial ambulance companies that stand to profit from such a turnover of services? It is hard to imagine how that type of transition could lead to an improvement in the top-level service now provided to the district. The president of the ESD 11 board and the other two members support the ballot initiative. In a statement to TexasGOPVote, ESD Board President Lynn LeBouef said, "I fully support the proposed tax increase for ESD 11 so that we can plan for future growth of our community and maintain the excellent EMS Services that the community has come to expect from Cypress Creek EMS." In addition to outstanding emergency medical care, CCEMS also leads animportant education center preparing future paramedics and other trained personnel vital to ongoing demands for service. Additionally, CCEMS provides a vital role in emergency communications and dispatch services for 11 fire departments, four EMS agencies, the Harris County Fire Marshall's Office, the Harris County Hazardous Materials Team and Blue Bonnet Critical Incident Stress Management. The Houston Chronicle reports that Saturday brings several very important elections to the voters in Harris County. School board elections, the Lone Star College Board of Trustees election and several ESD elections are all on the ballots. These elections can be the most important elections people can vote in. However, historically they receive the lowest percentage of voter turnout. These elections directly effect not only your property taxes, but the education of your children and, in the case of the ESD elections, your very health and safety. Typically these boards do not necessarily want your involvement in their elections. Because of this, there is not a unified ballot for all of the elections, nor common voting locations. They do this to keep you out of the process so their employees and contractors can have more impact in the outcome of the elections. It is incumbent on you, the voter, to make the effort to find the various polling locations and vote. Imagine a loved one suffering a heart attack and having to wait a couple of extra minutes for an EMS crew to arrive. CCEMS has a motto that reads, "When seconds count, count on us!" They have continuously met and exceeded that motto. Now CCEMS needs to be able to count on you. With low voter turnout your vote can make a HUGE difference. Get out and vote. A list of polling locations can be found on the Cypress Creek Mirror article about this election.